The Old Town Hall is located on the Main Square not far from the Maximilian Fountain. Since 1868 the building has housed the City History Museum. 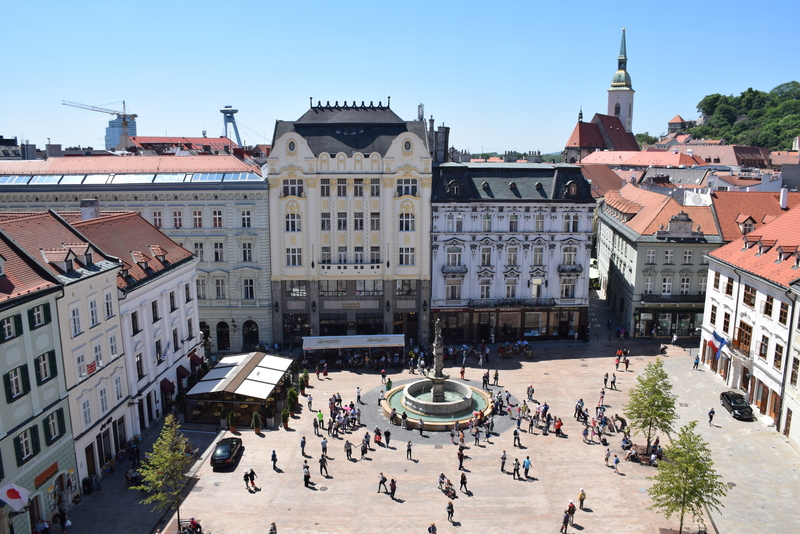 The tower offers a magnificent view of the historic city center. The admission to the observation deck of the Town Hall Tower is €2.50. 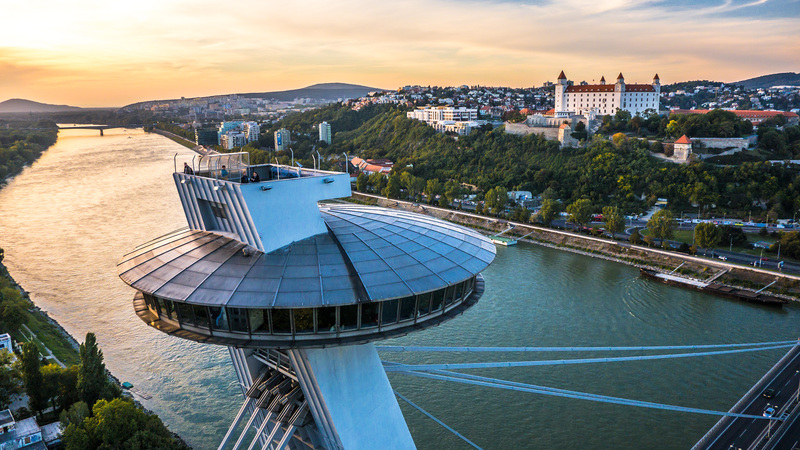 The observation tower above the Danube River is one of the symbols of Bratislava, the capital of Slovakia. The elevator ride to the viewing tower takes just 45 seconds. The UFO is perched 95 meters above the river, and daredevils with no fear of heights can look out in any direction more than 100 kilometers at the surrounding countryside. The admission to the observation deck is €7.40. But if you are going to be eating at taste.watch.groove, the restaurant inside the UFO, there is no charge for going out on the deck. The observation tower is open for visitors from 10:00 AM to 11:00 PM. 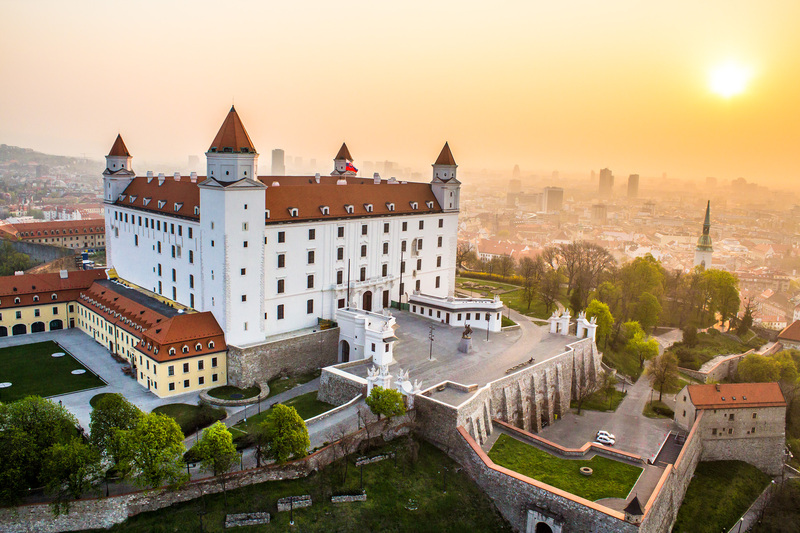 Situated close to the center, the Bratislava Castle is one of Bratislava’s most famous and visited monuments. Getting to the castle is easy as it takes just 30 minutes on the footpath from the center of town. From the courtyard, there is a view of Petržalka, the oldest of Slovakia’s housing estate neighborhoods, as well as of the UFO and the SNP and Apollo bridges. The courtyard is open throughout the year even during the evening hours. This is the ideal place for an evening walk as the sun sets. 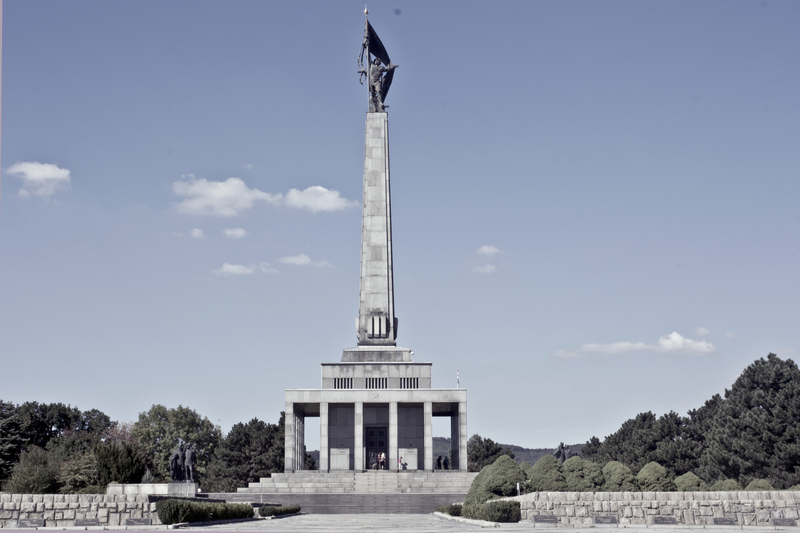 Slavín is the largest war memorial in Central Europe, and its 52-meter height makes it one of the city’s most dominant features. Buried here are 6,845 soldiers of the Soviet Red Army who fell in the liberation of Bratislava during World War II. Slavín is open anytime, but the best time to look out over the city is in the evening. Bus 147 leaves for Slavín from Hodžovo námestie every hour. Without a doubt, Devín commands the landscape where the Morava River meets the Danube. Since 1961 it has been a National Cultural Landmark. There is an exhibition in the grotto of the upper castle describing how the Devín Castle was constructed. The well-known legend-braided Virgin Tower captured on older coins minted in Slovakia dominates the view from the confluence of the Danube and Morava. 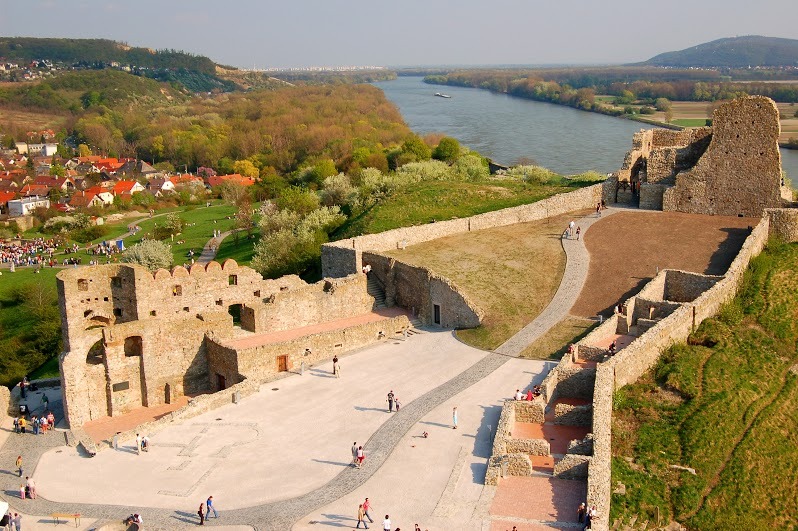 Devín can be reached by taking either Bus 28 or 29 from the bus stop under the SNP Bridge, and there is also access to the castle from the water by seasonal shipping lines that run from the center of Bratislava or the port at Hainburg, Austria. Adult admission between May 6 and September 30, 2017 is €5.00, while general admission between November and March is only €2. Please note that only the castle grounds are open during the winter. The exhibition areas are closed. Monday – Sunday 10:00 AM – 4:00 PM (last admission 3:30 PM) in good weather. Michael’s Gate was built in the 14th century and is the only gate from the city’s fortifications that has been preserved. It is located in the city’s historical district and has become a popular tourist attraction. Inside the gate is the Museum of Arms and also a statue of St. Michael for whom the gate is named. The tower balcony offers a panorama of the castle ridge along with the roofs and towers of the city as well as the view to the Little Carpathian Mountains. Admission to the Museum of Arms and Michael’s Tower is €4.50. The Kamzík television broadcast tower has been a landmark in Bratislava since 1975. Inside the tower is the Altitude Brasserie, a restaurant where you can enjoy a gourmet experience while taking in a bird’s eye view of the beautiful countryside. Follow the red hiking trail markers from the tower to the wooden lookout point, which is a favorite and quite popular meeting spot for both hikers and local visitors. 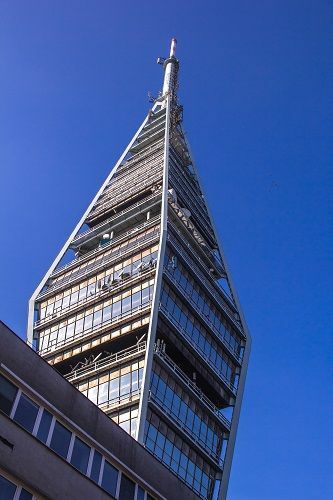 It is located in Americká lúka (America Meadow) close to the television tower. The area is quite attractive and the ideal place for family excursions or a not so long and strenuous bicycle ride. From the top of the lookout you can see a splendid panorama of the city, among the most gorgeous views of Bratislava that can be found. The path to the lookout only takes about 15 minutes to cross. The ideal connection to Kamzík is to take Trolleybus 203 from the Hodžovo námestie bus stop and then get off at the Koliba stop, continuing along one of several marked and unmarked paths. It sounds like a paradox, but the Old Bridge (Starý most) is the newest bridge in Bratislava, with the grand opening having taken place just in 2016. Trams crossing the bridge connect the old city to Petržalka. 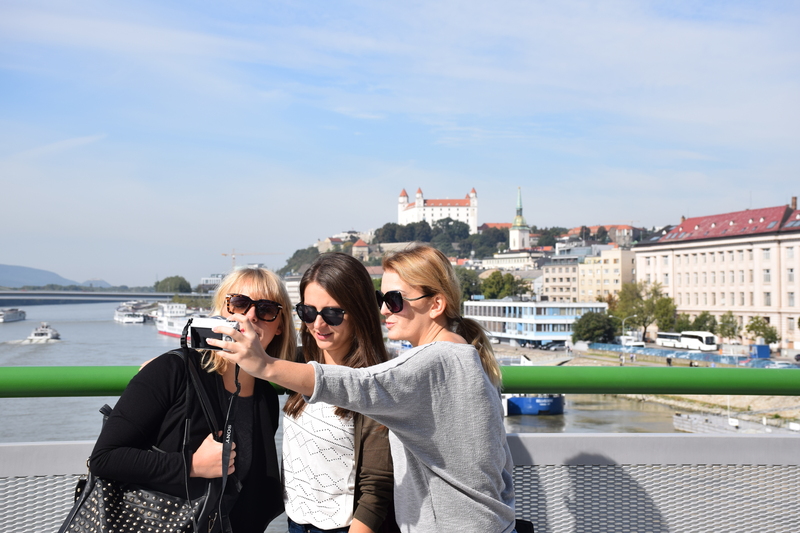 However, it is constructed to be especially used by pedestrians, so there are benches along the bridge offering fantastic views of the area around the Danube and the center of town. The Old Bridge has become a popular overlook point for tourists, which should not be surprising. Sandberg is the remnant of an ancient sea reef that stood here almost on the border with Austria 14-16 million years ago. 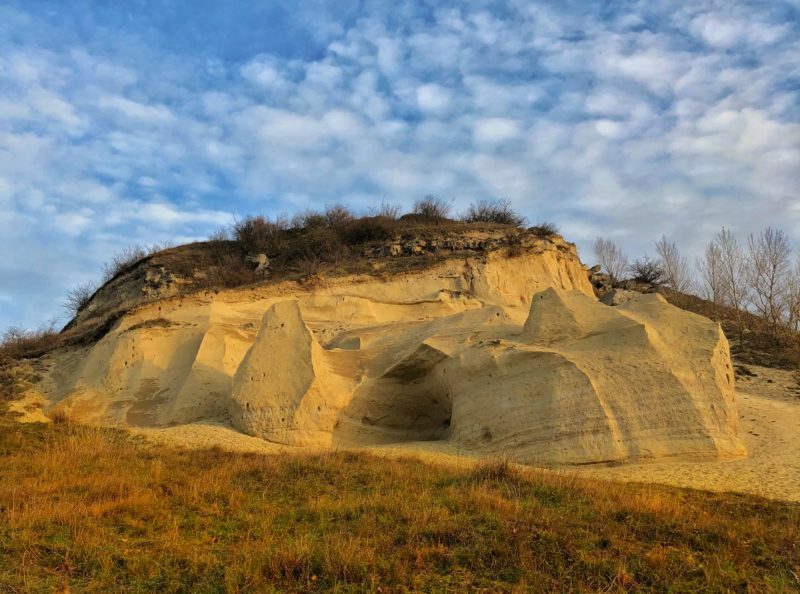 This hill made from sand is the westernmost spur of the Devín Carpathian range. In springtime, the area around Sandberg is covered with carpets of colorful flowers to delight the eye, alongside wonderful views of the Morava River, Devín Castle and into Austria. When the weather is clear, it is even possible to see the Alps from here. If you are planning to visit Devín too, an ideal excursion would be to join both these two sites and continue from the castle by following the blue trail markers to Sandberg. From the center of town, take Bus 28 at the SNP Bridge to Sandberg. The Outlook Bar & Lounge is located on the 13th floor of the Hotel Lindner and an ideal spot to spend a romantic evening enjoying the nighttime panorama of Bratislava, one of the most impressive to be seen. Dinner is served starting at 5:00 PM, and the restaurant is open until midnight. To get to the hotel from the center of town, either take Tram 4 from the SNP (UFO) Bridge station or Bus 78 from the New Slovak National Theater bus stop, getting off at Trnavské mýto.